This new module exports changes and new orders from the First Edition Subscription Software for linking to your web site. And it keeps track of which new and change orders have been processed. The new export makes it easy to keep an offsite subscription software database, such as a web site, up-to-date. It's easy to use, since it tracks which orders have been exported previously and allows you to export new and changed orders since that date. Of course you can override that by selecting your own date for new order and changes to be exported. Contact us for more information and purchase. Ecommerce clients will be able to display ad banners anywhere- even on non-Lynx sites. The system uses AJAX for fast banner rotation without page refreshing and supports banners of any size. The Ad Banner Module supports banners of images from uploaded images or can point to any URL. It also supports Flash, text-HTML, as well as text-script banners based for use with services like Google Adsense. Today, Lynx Media, Inc. announced the release of Lynx Ecommerce, a hosted subscription software web solution that synchronizes First Edition subscribers to the web. 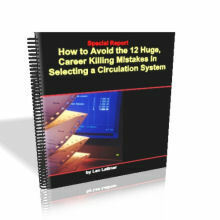 "How to Avoid the 12 Huge, Career Killing Mistakes when Selecting a Subscription Software System"
Making any one of the 12 biggest mistakes in selecting an in-house subscription software circulation fulfillment system can cost you thousands of dollars. Hard to believe but it’s true! Don’t fall prey like other publishers and circulation directors have done unknowingly. These mistakes could cost you your job or your business. This eye opening, shocking report, reveals the blunders that others before you have made. The facts you need to know are disclosed in a new Free Special Report. Lynx Media's release of First Edition 7 marks the biggest upgrade yet for users of First Edition. New features include the encryption of credit cards, 14 new reports, and a new forms system that supports groups and gifts. Len Latimer, President of Lynx Media, Inc., announced today that they have become the leading provider for football magazines that use in-house, circulation management software. Subscribe to our Lynx Media Newsletter - it's FREE! Lynx Media is a leading developer of PC based subscription software and product fulfillment software. Serving publishers since 1987, Lynx Media has extensive experience and a range of solutions that can meet the needs of just about any Subscription Management/Membership organization. Our PC, in-house based products include First Edition, a subscription management system, P.O.S.T., an order entry and product fulfillment system with inventory, LynxBingo, as reader service database for magazine bingo cards, and Lynx Ecommerce for web subscriptions and memberships. Lynx Media offers advanced automation features such as our one-pass update for issue closing which handles status management (expires, credit suspends, etc. ), continuity renewing, recurring billing, vacation/snowbird status settings, audit qualification, gracing, and dozens of snapshot issue fulfillment reports on each issue, saved in a database. In addition we offer advanced speed tools for data entry such as auto-capitalizing/uppercasing, pull down selection list, Order/Bill-to Templates, Group/Gift one-step order entry/renewal, USA and Canadian postal lookups for fill-in cities, state/province and phone area codes. We offer on-site training or web-based training. For web-based training, we connect to your computer via GoToMyPC, and work with your data on the problems you want to solve. In addition we offer data conversion services for both our subscription software and product fulfilmment software and have the experience of over 1,000 successful data conversions of a wide variety of subscription systems. Lynx Media fully supports NCOA (National Change of Address) and USPS’s ACS (Address Change Service) for publication. And we offer easy import of order/change transactions from web or telemarketing electronic files for new orders, renewals, payments, or changes. Our integrated Email Module offers users the ability to email renewals, bills, acknowledgements, as well as send email blasts to selected subscribers or prospects. As the industry standard navigational client/server database, Pervasive.SQL 2000i is used by professional developers, independent software vendors and value-added resellers to build mission critical applications. Pervasive.SQL 2000 ’s self-tuning engine runs 24x7, making maintenance a breeze and virtually eliminating the need for a dedicated database administrator—keeping your headaches to a minimum and your costs low.